At MIXT, we know how hard it can be to get kids to eat their vegetables. So we’ve made it our mission to make plant-based eating so tasty that even the fussiest eater will be hooked on smart choices. MIXT Kids features balanced and delicious options such as grilled chicken, roasted butternut squash, and grilled broccoli. We’ve crafted super-charged mini versions of the best MIXT meals to make it easier than ever to enjoy a healthy meal as a family. 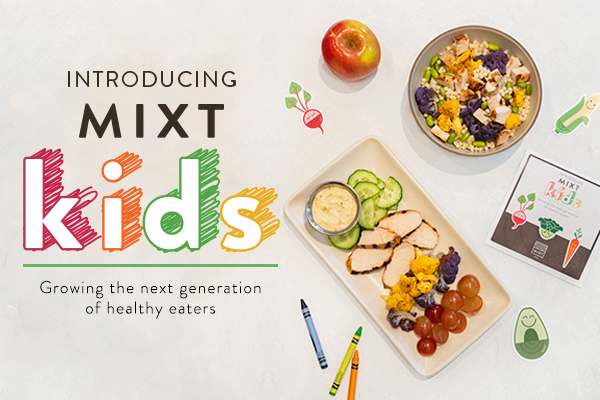 The MIXT Kids menu is offered exclusively at the following Bay Area locations: Cow Hollow, Mission, Yerba Buena, and Oakland. Each of our MIXT Kids locations is family-friendly (think high chairs and buckets of crayons) AND offers everything you know and love about MIXT, plus seasonal plates, and beer, wine & kombucha on tap. Let’s all eat better!